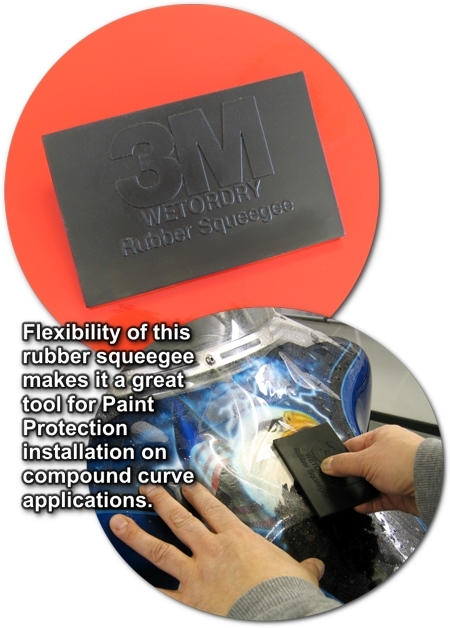 3M™ Wetordry™ Large Rubber Squeegee - 4 1/4" x 2 3/4"
Flexible and sturdy rubber squeegee, generally used in the auto body industry, proves to be a great tool for applying InvisiGARD® Paint and Headlight Protection films - especially for surfaces with compound curves. 4 1/4" x 2 3/4"x 3/16" (107.95mm x 69.85mm x 4.826mm). Packaged as one (1) squeegee. Tip: To reduce the possibility of slight mars that may occur on the film from sharp edges and corners of the squeegee, some installers file the edges and corners a little to allow the tool to glide over the Paint Protection film with ease.